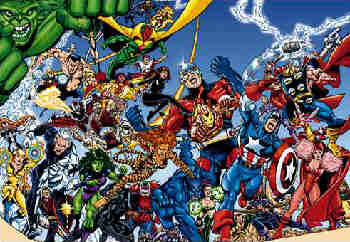 Justice League of America, the superhero group that includes a majority of the company's best-known characters and quite a few of its obscure ones. The Avengers got their start in a story by Stan Lee and Jack Kirby, dated September, 1963, in which a scheme hatched by Loki, the Norse god of mischief, happened to involve not just his enemy, Thor, but also Ant Man, The Wasp, Iron Man and The Hulk. All but the last were appearing regularly in what had formerly been Marvel's monster/sci-fi line; and The Hulk was between regular gigs. After the adventure's successful conclusion, they decided to meet regularly, to combat evil as a team. Kirby stayed with the comic for its first year, relinquishing art chores to Don Heck with the September, 1964 issue, but did occasional page layouts during its second year. Lee stayed on a while longer. In the years following, the series has been written by Roy Thomas, Steve Englehart, Kurt Busiek, and many other top comics writers; and drawn by such stellar artists as George Pérez, John Buscema and Neal Adams. The Hulk — not exactly a team player — quit in issue #2. In the fourth issue, Captain America, freshly revived from a state of suspended animation he'd entered during the closing days of World War II, joined. Seven issues after that, Spider-Man became the first superhero to be offered membership, and turn it down. By this time, the group was firmly ensconced in its first headquarters, a Manhattan mansion owned by Tony Stark (Iron Man's secret identity) and staffed by Edwin Jarvis, the butler who was to remain a supporting character for many years to come. The list goes on and on. Even The Two-Gun Kid became one of their reservists for a time. By 1985, the group had become so large (even with most members inactive at any given time), that some of its members were spun off into a second series — West Coast Avengers. Hawkeye set up a branch headquarters in Los Angeles, and several of the ongoing characters followed him into a new monthly comic, which lasted until 1994. A third group, calling itself Great Lakes Avengers, never quite got off the ground, nor was it ever officially recognized by the parent group. Surprisingly, it took until 1999 for The Avengers to appear on TV — or in any non-comics story media, beyond a paperback novelization or two. It was on October 30 of that year that an animated Avengers series joined X-Men and Spider-Man on Fox TV's Saturday morning lineup. It doesn't appear to have made much of an impression with viewers, but it's since been joined by an animated feature, Ultimate Avengers, released Feb. 26, 2006, so the franchise has at least grabbed a foothold in the media. Text ©2000-09 Donald D. Markstein. Art © Marvel Comics.